My experience on Aeromexico was excellent. I expected a comfortable seat and good service, but I did not expect onboard wi-fi that functioned extremely well. That was a very welcomed additional treat. I used Korean Air SkyPass miles to pay for this ticket. See my introductory post for more details. Aeromexico operates out of Terminal 2 at Los Angeles International Airport. I checked in 3.5 hours early and experienced no line, though the “Sky Priority” business class check-in lane was not open. The lounge issue aside, I enjoyed time in the Virgin Atlantic Clubhouse and later the Delta SkyClub prior to boarding, which began 55 minutes prior to departure at 10:30a. As I entered the aircraft, a flight attendant wearing a red jacket and red hat welcomed me onboard. 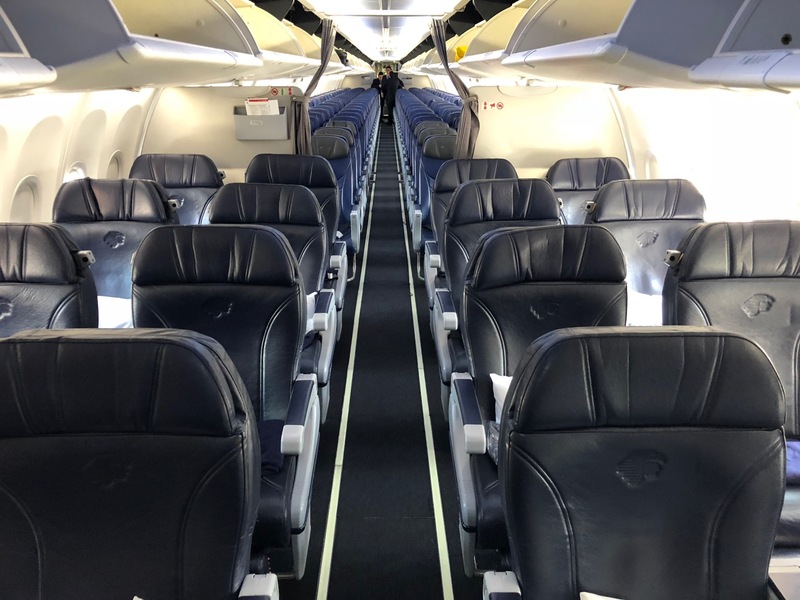 Aeromexico has updated its business class aboard the 737-800 to new seats that are slightly more comfortable than a typical domestic first class seat in the USA. The 16-seat cabin (four rows of 2-2) has 39 inches of seat pitch and a legrest. Seats can be adjusted by push button and are not electrically controlled. Each seat has a built-in IFE monitor and hand-held controller. Dual power ports are located in the console between seats. I was so pleased that Gogo wi-fi internet was available onboard, available gate-t0-gate, and functioned extremely well. I find in-flight wi-fi so undependable that I ALWAYS plan as if it will not be functional (ever since my Airfone incident). For this flight, it worked like a charm and I was able to stay connected and productive most of the flight. I was also able to use one of my American Express Platinum Gogo passes on the flight: otherwise the cost would have been $17.99 for the entire flight. With wi-fi working well, I did not take advantage of the in-flight-entertainment. I did note that the library included a respectable number of recent movies and box-set TV shows, as well as music. No games. Cheap complimentary headphones were provided. I used the lavatory to wash my hands prior to the meal service. There was nothing special about it – clean, but small. Prior to departure, a beverage of water, orange juice, or sparking wine was offered. Meal service began very quickly after we reached cruising altitude, with lunch choices being pasta or beef. No menus were provided. I ordered beef, expecting something like a steak. Instead, a hamburger was served sans cheese and a bun. Meal service arrived on one tray and included a green salad with balsamic dressing, bread, and the main course (served with bell peppers, tomato, and a red wine sauce). It was tasty and at least tasted somewhat healthy…there was no gristle in the meat. The only dessert provided was two small dark chocolate squares. I’m 0n a diet so I appreciated that Aeromexico did not tempt me with lavish cake or flan. Prior to landing, a ramekin of mixed nuts and another beverage was offered. While the pillow was soft and large, the blanket was scratchy and very heavy for a hot summer day. The bedding is much better on intercontinental flights, as I would soon experience from Mexico City to Paris. One goal I set for myself when flying on Spanish or French-speaking airlines is to try to communicate in those tongues. Make no mistake, my Spanish is poor and my French is even worse, but I make it a game to try to fool the FAs. On this flight, I succeeded! Every word and conversation with the FAs was in Spanish. It’s not like we were discussing geopolitics or dialectical materialism, though. Note that while Spanish is the default language, FAs also spoke excellent English. The two ladies working business class were extremely pleasant and attentive. I heard such horror stores from readers about Aeromexico prior to my trip but service on this flight was marvelous. We landed 25 minutes early and quickly pulled up to a gate. For whatever reason, though, we were not allowed off the (hot) jetbridge for about 15 minutes. Once again, this flight exceeded my expectations and I would have no hesitation flying on an Aeromexico 737-800 again. My experience on AM from ORD to MEX was vastly different. What happened on your flight? “Service shone”. Shoes are shined. @Matthew, I think those are leg rests instead of footrests… ;-p In any case, it looks like a perfectly acceptable short-haul premium cabin product. Also, I don’t think you ever clarified in any of your SkyClub posts about how you managed to access the lounge. Did you end up purchasing a Day Pass? If so, did you receive a refund in addition to the compensation? I changed footrests to leg rests. Thanks! The wait to get off the jetbridge is unfortunately very common at MEX due to the poor layout of the terminal – embarking passengers at several boarding gates need to cross the same hallway that is used by disembarking international passengers. The doors are constantly being repositioned to alternate between the two flows of traffic. I gathered that, but do you know why they can’t open two at once? 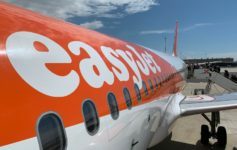 It’s not like the hallway could not accommodate two flights worth of passengers. why won’t you answer the delta sky club question? I either asked someone to accompany me in a guest, snuck in, or bought a refundable ticket. Let’s just leave the rest to our imagination. why don’t you want to say how you got in ? I found our pair of AM JFK-MEX-JFK flights a little more than 2-years ago in the pointy end to be equally good (service & food – but the cocktails were VERY good, too, and NOT rationed as so many other airlines seem to do nowadays! ), with the lounge experience at MEX as noted in Matthew’s separate post (at the same lounge, also late in the evening) to be equally disappointing. Guess not much has changed overall, in the air or on the ground, since our experience in 2016! Which seating were you in?